Introducing the new Air T-Line from Audio-Technica, its new Air Dynamic Headphones series with improved construction. ATH-TAD500 is an open-air headphones with large 53mm drivers with CCAW voice coil. Perforated Aluminum honeycomb case as well as Aluminum ring to allow a more natural sound reproduction with better air flow and reduced vibration. Designed to provide maximum comfort for a better listening experience, the new TAD Air T-Line is equipped with dual headband and velvet earpads. 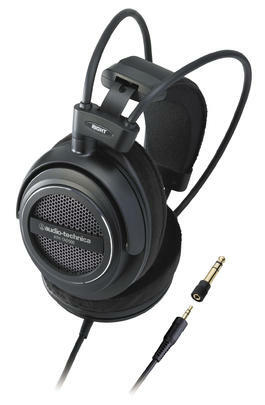 The TAD500 is a very comfortable, well balanced sounding headphone. The cups on this model are a little smaller and tend to fit better than the larger cups of the previous generation AD500 due to some added points of articulation that were previously fixed. Easy to drive, easy to listen to - the TAD500 has a very pleasing overall sound that suits any kind of music.